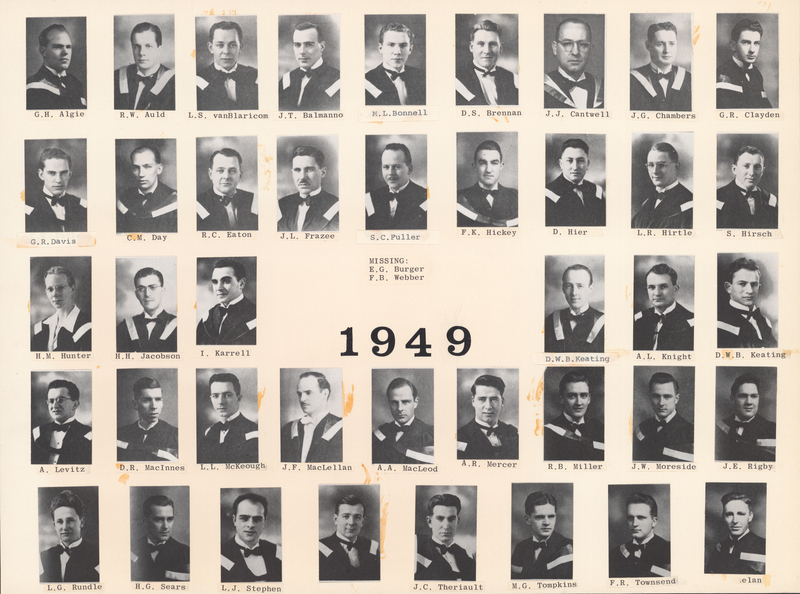 File is a composite photograph the Dalhousie Faculty of Medicine graduating Class of 1949. Photograph includes 45 individual portraits mounted on cardstock. Portraits include: G.H. Algie; R.W. Auld; L.S. Van Blaricom; J.T. Balmanno; M.L. Connell; D.S. Brennan; J.J. Cantwell; J.G. Chambers; G.R. Clayden; G.R. Davis; C.M. Day; R.C. Eaton; J.L. Frazee; S.C. Fuller; F.K. Hickey; D. Hier; L.R. Hirtle; S. Hirsch; H.M. Hunter; H.H. Jacobson; I. Karrell; D.W.B. Keating; A.L. Knight; A. Levitz; D.R. MacInnes; L.L. McKeough; J.F. MacLennan; A.A. MacLeod; A.R. Mercer; R.B. Miller; J.W. Moreside; J.E. Rigby; L.G. Rundle; H.G. Sears; L.J. Stephen; unknown; J.C. Theriault; M.G. Tomkins; F.R. Townsend; unknown.